South African President Jacob Zuma attends a May Day rally in Bloemfontein, South Africa, May 1, 2017. 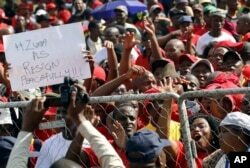 South African President Jacob Zuma was booed off the stage Monday as he tried to address a meeting of the country’s largest labor union. Analysts see evidence of deepening rifts in the ruling African National Congress and Zuma’s increasing isolation. When President Zuma arrived at the main event of the May Day celebrations in Bloemnfontein, Free State Province to deliver his speech to thousands of workers, a section cheered him. But a larger group sang and chanted anti-Zuma slogans. Zuma left the event without uttering a word. Organizers aborted the rally. Workers hold placards during a May Day rally in Bloemfontein, South Africa, May 1, 2017. In the past, such disruptions have come from the opposition and anti-Zuma groups, but this time it came from the members of the Congress of South African Trade Unions, who are largely ANC supporters. Political Analyst Somadoda Fikeni says pressure is mounting on the ANC to deal with Zuma, who has been battered by corruption scandals. “If ANC can not begin to imagine a post-Zuma ANC, then South Africa will begin to get used to a post-ANC South Africa, and that is the political cost of not reflecting on some of the weaknesses attracted by the president from one time to the other,” said Fikeni. The presidency has not issued a statement about the incident Monday. But Free State province ANC chairman Ace Mahashule remains adamant Zuma is not going anywhere until his term expires in 2019. "The ANC says this is the man who must be leading the country and our masses will say so and they have said so," said Mahashule. "They have voted Zuma. There is no way you can say Zuma must go, because if you say so, who are you?" 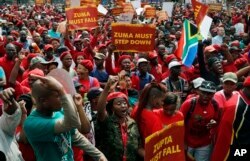 But Monday's incident points to tensions with the ANC’s alliance partners, COSATU and the South African Communist Party. The two publicly called on Zuma to resign last month after a controversial Cabinet reorganization. Analysts say the alliance, which has assisted ANC to win all national elections since 1994, may be in danger. FILE - Opposition political parties gather on the lawns of the Government Union Buildings in Pretoria, April 12, 2017. The opposition greeted Monday’s events enthusiastically. Economic Freedom Fighters spokesperson Mbuyiseni Ndlozi called it a boost for the upcoming no-confidence vote against Zuma in parliament. ”We are very inspired and we will sustain their effort in making sure that Zuma is not legitimized. When we go back to parliament we will make sure that, that particular action and sentiment expressed, finds articulation in parliament,” said Ndlozi. Meanwhile, the Constitutional Court is considering an opposition request for the no-confidence vote to be a secret ballot. The ANC holds a majority in parliament, but analysts say a secret ballot could see parliament members from SACP, COSATU and even the ANC join the opposition.